The Ahemmusa Tribe is one of the four distinct tribes of the Ashlanders of Vvardenfell, in the province of Morrowind. The Ahemmusa are some of the most peaceful tribes in Vvardenfell and other parts of Morrowind, but they also like to be isolated and kept to themselves. They are hunters, herders, and mostly fishermen that live off the fat of the land. Because they are proficient fishers, they can be found in their own settlement, the Ahemmusa Camp, which is normally found in coastal areas. Their clothing reflects this as well, when it consists of seashells, scales, and netting. The rare Ashen Fern is used by the Ahemmusa Tribe to mask their scent when hunting. The An-Xileel are a political party in Black Marsh formed sometime during the Oblivion Crisis, consisting primarily, if not entirely, of Argonians. They supported Black Marsh's independence from the Empire and were said to spread anti-Imperial propaganda, capturing prisoners of war. Many Argonians firmly held the belief that the An-Xileel were the sole reason that Mehrunes Dagon failed to conquer Black Marsh during the Oblivion Crisis. The ruins of the Ancients are similar in style to the Ayleid ruins found on mainland Tamriel. However, Altmer architecture is cleaner and more direct, with less baroque ornamentation than that of the Ayleids. As well as Dawn Era Welkynd Stones, the ruins also contain Malondo and Culanda Stones, modern inventions of the Altmer which were not utilized by the Ayleids. Anthotis is one of the vampire bloodlines of the Iliac Bay area. The Ash'abah are an ancient and secretive tribe of Redguards who inhabit the northern wastes of Hammerfell, roaming the Alik'r Desert. They are shunned by Redguard society due to their "unclean" interactions with the risen dead, as they disregard religious taboos and destroy the undead, slaying with great skill what might be honored ancestors returned. Against the widespread distrust of magic, the Ash'abah perform rituals of purification for mausoleums and other places where vengeful spirits might arise, including an annual ceremony at Tu'whacca's Throne meant to ensure the rest of the ranks of Redguard royalty. This activity is regarded as blasphemous, but tolerated due to the necessity of its performance. The Ash'abah consider the body to be sacred. If one ever becomes corrupted by necromancy, they strive to preserve the body while banishing the unholy essence. To achieve this, they have developed highly ritualistic methods of killing that involve uttering pleas of forgiveness and apology. Unlike the settled Dunmer of the Great Houses, they did not acknowledge the power of the Tribunal; rather, they believed the Tribunal betrayed Lord Nerevar at the Battle of Red Mountain, and that they were kept alive by magical means not unlike necromancy. 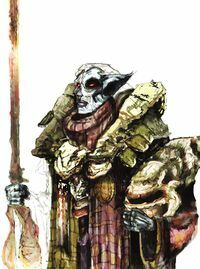 The Tribunal's disappearance and the disastrous Red Year of 4E 5 eventually led other Dunmer to abandon widespread Tribunal worship and to appreciate the Ashlanders for preserving their heritage. Aundae Clan is one of the three major vampire bloodlines found in Vvardenfell. This page was last modified on 27 October 2014, at 14:45.